The Visitor Centre – Caerphilly is a perfect place to relax and enjoy the impressive views of Caerphilly Castle. The friendly and welcoming staff are on hand to ensure that you get the very most of your visit to the area. This is the ideal place to go if you need any help or advice about the local area. For visitors, the Centre offers independent advice with the planning of routes & the booking of accommodation. It also has lots of information on places to visit as well as an impressive gift shop displaying locally made quality crafts. All the staff lives locally, have a wealth of knowledge, so can help with any aspect of your visit. An important item for many visitors is to find some Caerphilly cheese. Well, look no further; you will find some here, made in Wales. Upstairs is a very pleasant cafe with a dramatic view out over Caerphilly Castle. The Coffee Lounge is not just a place for the visitor to Caerphilly; it is very popular with the local residents. This is not surprising with the friendly and welcoming staff, marvellous views, great décor and a happy, chatty clientele. 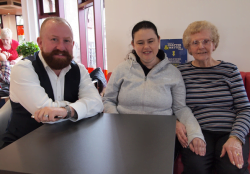 Early this year, members of Caerphilly 50 plus Forum met with the Centre manager, Martin Cook. Martin has been responsible for transforming the Centre into the vibrant and profitable entity that it now is. We wanted to introduce Martin to the concept of the “Chatty Café”. We thought that the Visitor Centre had all the right attributes to make Chatty Café a success. Martin was most enthusiastic about the concept and plans were put in place to introduce it in late March. 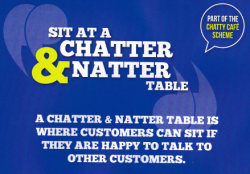 What is a Chatter & Natter table? Just somewhere that you know anybody sitting there is prepared to interact and have a chat; just a good old human interaction. We thought the Visitor Centre Coffee lounge was an ideal venue to introduce this.